Your garage door is more often than not the largest moving part in your home, and because you need to use it multiple times a day in all seasons, you need to make sure that you maintain it regularly to prevent any issues. Here are the top five maintenance tips for homeowners. It goes without saying that the components require regular cleaning in order to work properly. As such, try to give all rollers, hinges, and latches a good wipe at least twice a year. Spring and fall are good seasons for regular maintenance, preparing for the cold or heat of the next. You can use a squirt of a penetrating solvent such as WD-40, or wipe a bit of oil on the torsion springs if they look and feel a bit rusty. Inspect the rollers twice a year to check their condition. As a rule of thumb, they need to be replaced every seven years or more often if you tend to use the door multiple times a day. Have a look at the rollers and replace any chipped, worn, or cracked ones as soon as possible. Keeping the moving parts of your garage door well lubricated only takes a couple of minutes, but it will add years of smooth operation. Use a quality spray lubricant to code the overhead springs, and some white lithium grease for the screw or chain of the opener. It is easy to test the auto-reverse safety feature to make sure that it works as it should and protects your family from any accidents. There are two parts of the auto-reverse mechanism: the photocell and the mechanic. Test the photocell one by passing your leg through the laser beam as you close the door. For the mechanical part, place a brick or piece of wood on the ground to see if the door goes into reverse when it touches it. It's important for your garage door to be correctly balanced, so you should perform a balance test regularly by closing the door normally and detaching the opener. Next, lift the middle of the door to the half way mark and let it go. 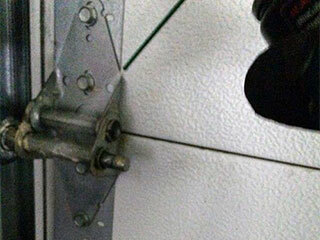 If the door falls too quickly, there is something wrong, and you should have your door rebalanced as soon as possible.